This project ended up being even easier than earlier planters. Basically, the project involved filling the face-down open screen area with small-grid wire mesh and securing it in place; easily done by anchoring it with wire onto metal clips welded inside. Then sheets of dried floral moss were used to cover the entire area, followed by a layer of cactus soil mix. Next I placed a sheet of lightweight corrugated plastic (think real estate lawn signs) over the metal frame and using a marker traced its shape. 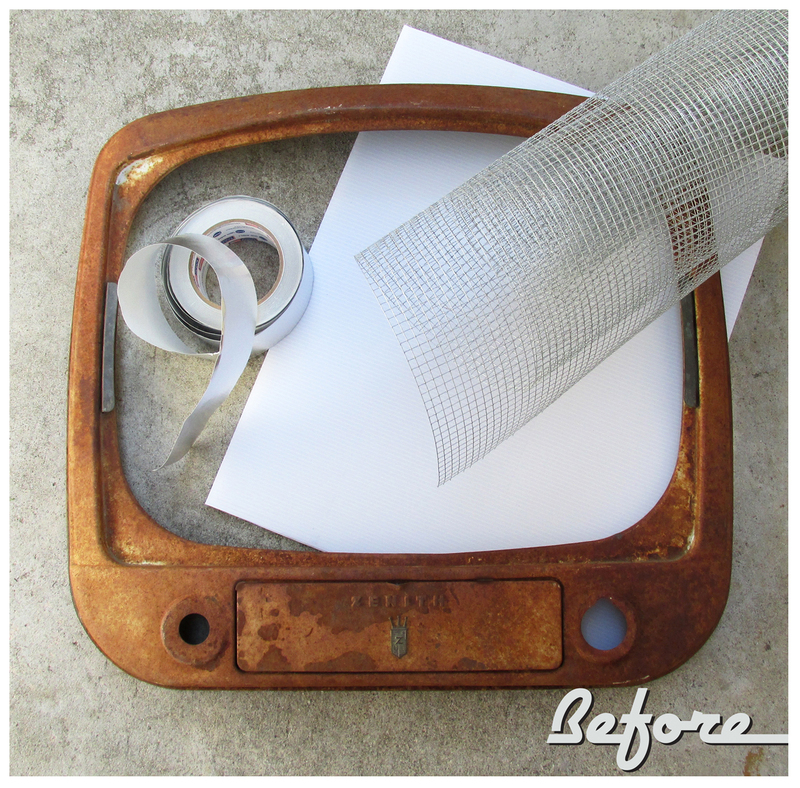 I cut it out with a utility knife, and using rust-colored paint, sprayed the entire shape. Once dry I positioned it onto the frame, and using aluminum tape secured it all around the edge. For extra security I then taped the entire backside, first horizontally, then vertically, with more tape, overlapping the frame a 1/4″ on the ends. Tape done, I sprayed the silver tape overlap with rust paint. When dried I turned it over and had a perfect gridded area in which to begin planting. Using metal snips I selectively cut openings into the mesh, folding back the cut mesh and sliding plants into the openings. 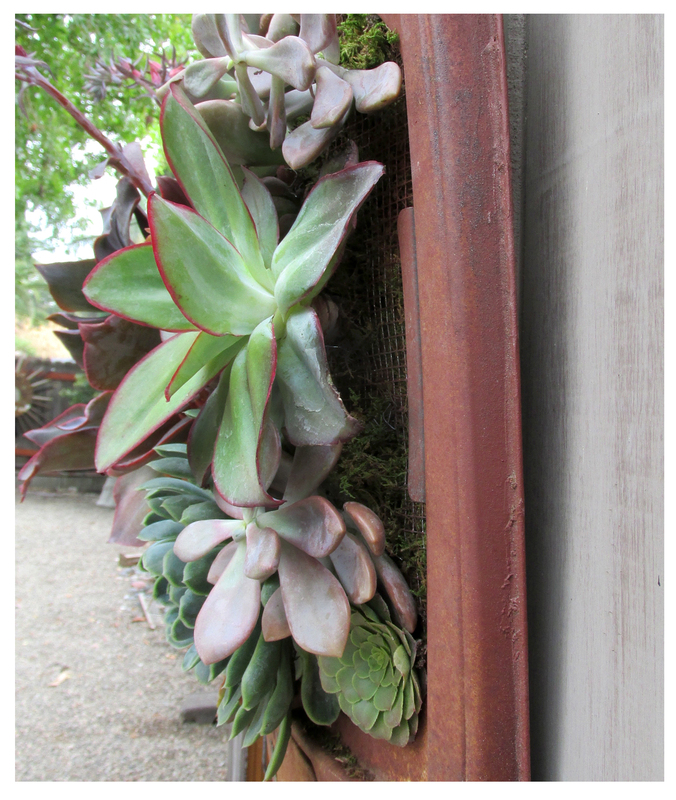 Using mesh flaps, and additional moss when necessary, I was able to ensure plants fit snugly. Largest plants went in first followed by ever smaller ones, until the screen was filled to my satisfaction. As you can see, the frame itself is not very deep, 3 inches at most. By pushing in, and varying the direction of entry, I was able to fit in quite a few plants, including their stems and roots. This multi-directional positioning helped make the composition livelier, providing a layered effect. Of course, the real stars of this TV show, are the succulents: In amazing shades ranging from coolest aqua to fleshly mauve and hottest red-orange; with perfect rosette foliage made of petals and ruffles and scoops … with can’t-be-contained flower stalks ending in pink trumpets, no 3D glasses required. I’ve got to complement you on your ingenuity, it actually made me chuckle when I saw this after reading your tag line. What a cool idea! I really love the way you take objects and take an abstract look at them and come up with such great ideas. Many times, I set back and think, why didn’t I think of that! Very cool, I love it! Although I don’t comment on many posts, I always love the stuff you put on your blog, it never fails to give me fresh ideas and new ways to look at objects that are “outta the box” concepts! Keep it up, they’re great! Sam, thanks — For taking the time to comment and for being so complimentary … I appreciate it! Reuben!!!! I love this so much. You continue to inspire me with your creativity and ingenuity. I can see myself buying that rusted metal television frame. 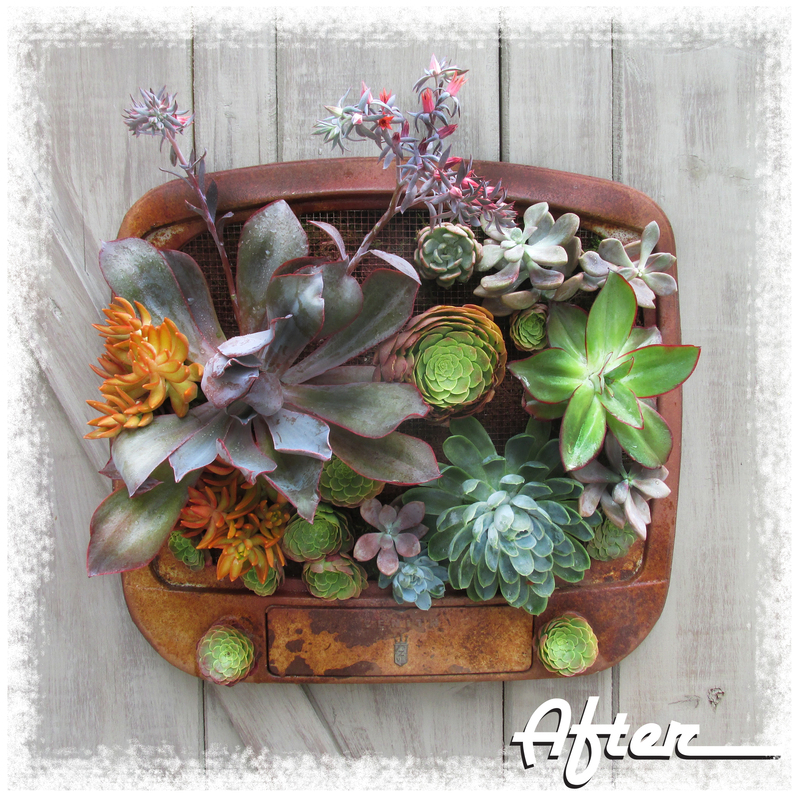 One question…will you use a spray bottle to water it, or do you have another plan? I love how you give us the step by step instructions. I’ll be honest, I’m not always a word for word reader, sometimes I skim the paragraphs and then move on to the photos. However, when I have a question that I’m going to ask you, I inevitably tell myself to go back and read what you wrote and low and behold, the answers already there. You’re so good. I’m still waiting for you to hold some classes in your awesome outdoor studio/garage. I would sign-up for sure. Love it!! It’s a joy when we finally hear what a piece of rust is telling us what it wants us to turn it into. You kinda make me want to get some of my starteds to finished. Have been having a lazy problem lately. I thought that I’ve told you that you’re always welcome! Just give us a call!! I’ve been piddling along but only looking at the completion of a couple three pieces. Nothing too exciting. For some reason I just can’t quite get my motor started past the idea stage. Oh well, all happens in it’s time. Reuben, I would love to visit your studio, but I live so far from you….Costa Rica. So, I really enjoy seeing the lovely things you you come up with. Your ideas are truly inspiring. I want to try the one you did with the dried branch of the palm tree and succulents. I would love to send pictures of some of my projects, but I don’t have your address. Genius as always, Reuben. I did a double-take when I saw it. Fabulous. Reuben ~ This DIY is absolutely gorgeous! It one of the most beautiful arrangements I have seen. I love the creative use of an old TV. Just fabulous. Thanks for commenting, Naomi … it was a fun project!